SINGAPORE, December 17, 2018 – Singapore’s structural transformation efforts to boost productivity and innovation remain firmly on track, while the economy is expected to moderate going forward due to the easing global tech cycle and impact of the China-U.S. trade conflict. This is according to the preliminary assessment by the ASEAN+3 Macroeconomic Research Office (AMRO) after its Annual Consultation Visit to Singapore from November 19 to December 7, 2018. 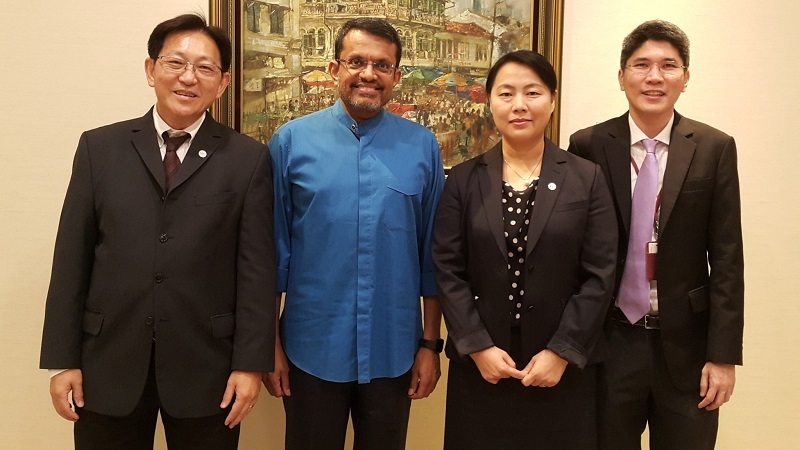 The mission was led by AMRO Lead Economist Dr Chaipat Poonpatpibul, and Director Dr Junhong Chang and Chief Economist Dr Hoe Ee Khor participated in the main policy meetings. Discussions centered on the spillovers from the U.S.- China trade tension and its impact on growth, the property and labor markets, and structural transformation to boost productivity and innovation. Following a strong expansion of 4.3 percent in the first half of 2018, Singapore’s growth is moderating as the cyclical uplift from the global tech rebound is fading. Nevertheless, the labor market remains tight, as evidenced by higher wage growth and the stable unemployment rate. Downside risk to growth in the short term has increased mainly due to the trade conflict. Pockets of domestic vulnerabilities exist arising from the smaller firms and lower income households that are susceptible to rising interest rates and weaker economic conditions. Authorities should continue to monitor developments in the trade conflict closely. Fiscal policy can play a leading role to mitigate the impact of the trade conflict. For vulnerable sectors, the government can provide temporary financing assistance or extend the corporate income tax rebates, complemented by advisory services about potential trade issues. More broad-based measures such as promoting employment and retraining, as well as frontloading of infrastructure investments can be considered, if the trade conflict leads to a sharper global downturn. The normalization of monetary policy in response to the steady improvements in the labor market, above-potential growth, and rising inflation has been in line with the objective of maintaining price stability in the medium-term. Should trade tensions escalate more sharply than expected, and a much worse than anticipated deterioration in the external environment significantly affect the overall economy, the Monetary Authority of Singapore can consider re-evaluating its present monetary policy stance. On the social front, authorities are encouraged to strengthen social safety nets to improve welfare and mitigate the impact of adverse shocks on vulnerable segments of the population. In July 2018, authorities have increased the Additional Buyer’s Stamp Duty (ABSD) rates and tightened the Loan-to-Value (LTV) ratios to prevent private residential property prices from overshooting and keep property prices in line with economic fundamentals. The planned land sales for private residential housing in the first half of 2019 have also been reduced, in anticipation of a large supply next year. Going forward, the authorities should continue to adjust the overall housing supply, taking into account the pace of population growth to ensure stability in the property market. Authorities are committed to restructuring the country towards a high productivity, and innovation-based economy. All 23 sector-specific Industry Transformation Maps (ITMs) have been rolled out, and the FY2018 Budget has included more targeted schemes to encourage greater adoption of digital technologies and enhanced upskilling efforts. In the area of Fintech, the authorities have been proactive in facilitating innovation while ensuring that activities are within the regulatory boundary, including enabling greater collaboration among financial institutions and Fintech firms. At the same time, cyber breaches can potentially lead to business disruptions and erosion of confidence, and is an important risk area that needs to be addressed. In this regard, it is commendable that cyber risk mitigation efforts have been strengthened on various fronts, such as an enhanced cyber-risk assessment framework for financial institutions and multiple platforms for information sharing domestically and internationally. The mission would like to express its appreciation to the Singaporean authorities and all counterparts for their great assistance and warm hospitality. The consultation visit has deepened AMRO’s understanding of the country’s current macroeconomic and financial situations as well as ongoing efforts to address the risks, vulnerabilities, challenges and opportunities confronting the economy. The ASEAN+3 Macroeconomic Research Office (AMRO) is an international organization, established to contribute to securing the economic and financial stability of the ASEAN+3 region, which includes 10 members of the Association of Southeast Asian Nations (ASEAN) and China; Hong Kong, China; Japan; and Korea. AMRO fulfills its mandate by conducting regional macroeconomic surveillance, supporting the implementation of the Chiang Mai Initiative Multilateralisation (CMIM), and providing technical assistance to its members.